It positively revolts me you haven’t gotten more commentary on this amazing, jaw dropping piece of work. She’s one of the few designs I saw in the contest worth a hill of beans. Most of the designs were simple photo manipulations of the existing vessels from Star Trek Online. Most of the others were just cheap knock offs of the Enterprise E design style. But this has a beautiful, jaw dropping style that sets it apart from all the rest of the entries. Her beautiful mirrored quadruple nacelle design, combined with the merged hull design and beautiful, almost submarine like curves to the central drive section as it overlaps on top of the saucer section. I’ve got a few questions about this design, though! Is that a single torpedo launcher above the deflector dish and another one towards the forward end of the saucer section? Also, I see the lower hull shuttle bay, but is that another one on the upper hull near where the nacelle pylons meet the hull? Also, how many decks tall is it? I count about eighteen rows of windows, but that doesn’t always mean anything in particular. Thanks for the kind words and I’m glad you liked the design. In answer to your questions, yes, those are torp launchers in the locations you mention as well as a pair of aft firing launchers right at the back of the secondary hull. The inset on the upper hull is most likely an auxiliary shuttle bay, though I didn’t detail it out so it could be almost anything. There are 18 distinct rows of windows but there could conceivably be 20 or more actual decks. To be honest, I didn’t put a lot of thought into things like exactly how big this ship is, other than a general desire to avoid making it 100 decks tall or three miles long or some other ludicrously fanboyish set of figures. I had a vague idea that the saucer was probably about the same size as the Sovereign class and went with it from there. I consider this more of a concept than a finished design and there are a few things I would tweak for the final in-game version if I have the opportunity. And, of course, if I actually win. Thanks! I’d like to think I managed to throw a few elements into the design that haven’t really been tried before, which is quite the challenge for a Trek ship. Ironically, those are the very elements I’ve gotten the most criticism for on the STO forums and elsewhere, most notably the “guppy mouth” deflector. I’m always amused by peoples’ varying opinions on what a ship named Enterprise is or is not supposed to have. Just goes to prove you can’t please all of the people all of the time. 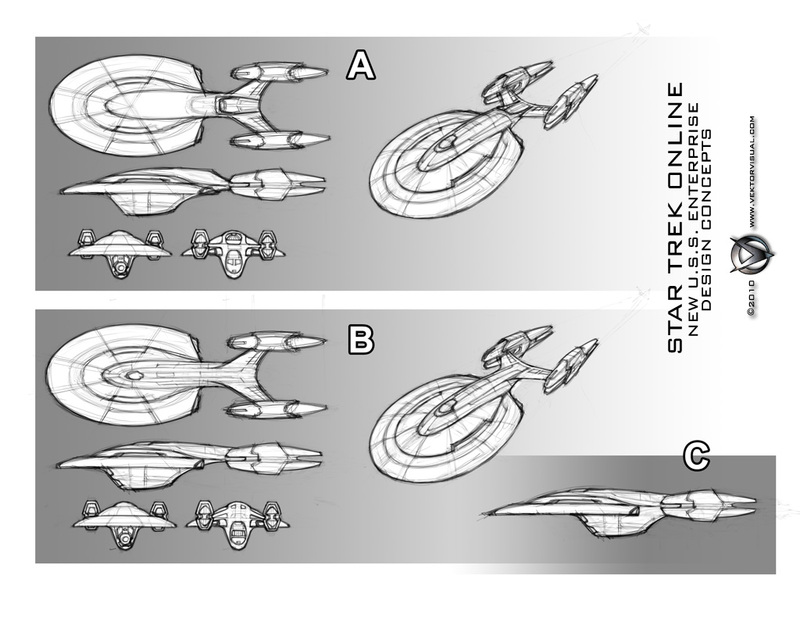 By the way, John, giving credit where credit is due, I pretty much blatantly ripped off your presentation motif with the LCARS border from some of the concept art you did for STO back in the pre-Cryptic days. I think I even used the identical background color! I figured I might as well start from a winning formula. This is the first time I’ve really seen your entry in high-res – gorgeous and imaginative, as usual! I’m intrigued by the underside of the saucer, where it reminds me of a mushroom cap, and looks like there may be hidden ‘tech’ back in there that could come sweeping out of that wraparound cavern. I also think this is one of the finest examples of integrating the saucer and secondary hulls into a single, harmonious unit. You even managed to integrate the escape pods into the design as graphic elements, rather than the usual hideous puncture marks that they tend to come off as . I lIke the way your mind thinks it outside the box and keep it that drawing star ship ore other things you like to draw. Very nice rendering, I would imagine this would be one hell of a big ship? I made up a drawing rendering back in 1992 of the futuristic enterprise that was eventually used in the final episode of STTNG with the third Nacelle and the anti proton cannon. I didn’t get the credit for it since I went about submitting it the wrong way, but it was still great to see my idea used. Your ship design would be a great ship to see on the big screen. Your ship hits STO this week as one of the 1000 Day Vet Rewards. have you seen what they did to your ship? it has become one hell of a ship. with the ability i call “beast mode”. nice job. you should be proud. Your work is amazing, your talented and should be proud. Did you fully conceptualize the whole beast mode attribute while initially constructing the design? No, I had nothing to do with the ship’s transformational abilities. That was all Cryptic’s work, but I wholeheartedly approve. The design has grown on me since I have the ship. However, I hate the Transformer Megazord transformations. While I can’t do anything about sector space I replaced the console with another phaser relay. Still works great. There are a couple of things I might have done differently myself with the animations. I think the way the saucer breaks into segments is a little awkward but still not bad. I also wish they had used the updated version of the deflector dish, which was intended to reduce the “guppy mouth” criticisms. But overall, I think the ship looks really good. The cryptic team really nailed the proportions and specific details from my concept sketches. I really like the design. The quad nacelles are a logical step. My only reservation is the deflector dish, in that it doesn’t look too much like a dish. I always thought it would be neat if a future enterprise could use its dish to tear a hole into subspace. It didn’t become the next enterprise, but your ship is the 1000 day veteran reward for federation players. Personally, the abilities they gave your ship are much better than the Odyssey class ship. I love your ship.